For buyers seeking sensible transportation infused with a healthy dollop of fun, the 2020 Kia Soul hits the mark. The 2020 kia soul electric vehicle qualifies for a federal tax credit of up to $7,500, effectively reducing the net base price. Since its debut in 2009, the Kia Soul has merged sassy style, SUV-esque functionality, a modest price, and a long 10-year/100,000-mile powertrain warranty. For buyers seeking sensible transportation infused with a healthy dollop of fun, the Soul hits the mark. Over the years, competitors have come and gone but the Soul, now in its third generation, endures. All-new for 2020, the Kia Soul lineup has diversified and now includes a thrifty $18,485 LX trim, the sporty GT-Line, a rugged X-Line (sadly not offered with all-wheel drive), and an all-electric Soul EV boasting a 243-mile range. The subcompact-SUV category is filled with alternatives including the Nissan Kicks, Toyota C-HR and Honda HR-V but the 2020 Kia Soul remains a standout where style and value are concerned. Do you want a nice-driving, spacious and inexpensive vehicle to propel you and your lifestyle in style? If so, the 2020 Kia Soul is a winning choice. The Soul’s lack of all-wheel drive may make it a non-starter for those in wintry climates. That all-wheel-drive omission is doubly odd given the arrival of an off-road-inspired Soul X-Line to the lineup. The Kia Soul is all-new for 2020. With a longer wheelbase and a stiffer chassis, this all-new Kia Soul moves with a sophistication not found in previous versions. The interior is comparatively quiet at higher speeds, and ride quality is more than acceptable despite the use of a low-tech torsion-beam rear axle. Note: to accommodate its battery pack, the Soul EV features a more sophisticated independent-rear suspension. In classic Soul fashion, an elevated seating position and large side glass afford occupants an outstanding view outward. On paper the base 2.0-liter engine’s 147-horsepower output should disappoint but the CVT (continuously variable automatic transmission) it’s paired with (excluding the LX trim’s 6-speed manual) does an admirable job maximizing available power. Full-throttle acceleration fills the cabin with a strained 4-cylinder wail but for normal commuting the 2.0-liter is up to the task. More spirited Soul drivers will gravitate to the Soul GT-Line, whose optional 1.6-liter turbocharged engine and sport-tuned suspension amplify the thrill quotient. Reserved for higher trims, this wide-format screen provides a sizable canvas on which to easily view navigation, audio and phone functions. Since most Americans own a smartphone, we love that Kia has kindly included Apple CarPlay and Android Auto smartphone integration on all trims. These technologies allow users to access their phone’s music, podcast, navigation and other abilities safely through their vehicle’s touch screen. The tidy little Kia Soul hides a deceptively huge interior. Occupant space is ample in all positions, thanks to excellent head and knee clearances plus generous rear-passenger foot space under the front seats. Material quality varies, with higher trims trading rigid plastic surfaces for fashionable stitching and softer materials. Behind the rear seats, cargo capacity peaks at 24.2 cubic feet. That’s a competitive figure for such a small car. Adding to the Soul’s functionality is an optional dual-level floorboard that can be positioned low for maximum luggage space or raised to create a flat load area that smoothly merges with the folded rear seats. Now in its third generation, the Soul’s distinct upright profile remains. However, the nose and tail now possess a modern, technical essence that adds gravitas to the previously playful Soul’s design. The base LX trim has 16-inch steel wheels as standard, but all other models offer alloy wheels ranging from 16 to 18 inches in size. Adding to the standard Soul’s stylistic panache is the Soul X-Line, which presents a brawny visage via plastic body cladding and 18-inch wheels. There’s also the GT-Line, whose red accents, aggressive front and rear fascias, and unique wheels paint a distinctly sporty picture. In its most elemental form, the Kia Soul LX trim includes cloth seats, a 6-way-adjustable driver seat, air conditioning, six airbags, and a 7-inch touch screen featuring a USB input, and smartphone integration by Android Auto and Apple CarPlay. The base trim includes most of the essentials. However, we’d recommend shelling out a few extra bucks to add a center-console armrest and cruise control. Move up from the base trim and you can equip your Soul with niceties like LED front lights, smart key access with push-button start, a 10.25-inch touch screen with navigation, extra USB ports, dual-zone automatic climate control and heated front seats. For our money, it’s worth upgrading to at least the S trim whose slightly-more-than $21,000 price tag includes active driver aids like lane-keep assist, blind-spot warning and forward-collision warning. Reserved for the priciest GT-Line 1.6T are dynamic cruise control, collision warning with pedestrian detection, flashing speaker lights, and a head-up display. 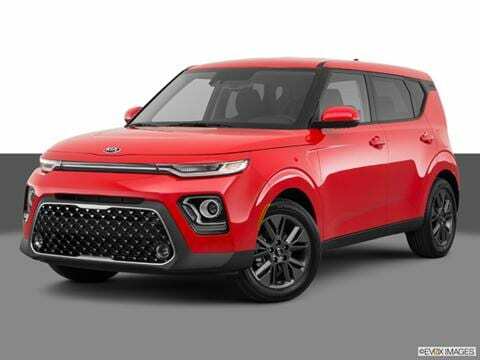 Most 2020 Kia Souls will feature a 2.0-liter 4-cylinder engine teamed with the continuously variable transmission. Spicing things up is a 1.6-liter turbocharged engine offered in the GT-Line. It delivers raucous acceleration…along with a bit of turbo lag at low revs and noticeable tugs through the steering wheel at full throttle. The 1.6-liter engine also comes paired with a 7-speed dual-clutch transmission. We like the dual-clutch’s quick shifts but departures from a stop can feel clunky. Kia’s automatic engine start/stop system, dubbed ISG, comes standard on all trims aside from the LX where it’s optional. The system can be deactivated but fast, smooth restarts make us inclined to just leave it on. A base 2020 Kia Soul LX trim with a manual transmission rings in at $18,485 including $995 in destination charges. For our money, spending an extra $1,300 for the S trim is a wise move. The S Trim’s premium brings with it several valuable driver-assist features along with the convenience of a CVT automatic transmission. Buyers with boundless budgets will gravitate to the Kia Soul GT-Line 1.6T, whose sweet features and zesty acceleration command an equally zesty $28,485. If you like the GT-Line 1.6T’s style but want to save some cash, the basic, 2.0-liter powered GT-Line costs a full $7,200 less -- albeit with a less dazzling feature set. The electric-powered 2020 Soul EV is expected to start around $35,000. Versus competitors like the Honda HR-V and Toyota C-HR, the Kia Soul is competitively priced, though a basic $19,585 Nissan Kicks includes automatic emergency braking, a feature reserved for the $1,700 pricier Soul S trim. Check the KBB.com Fair Purchase Price to see what others in your area paid for their 2020 Kia Soul, and note that resale value is generally very good. It’s also worth mentioning that the Soul has traditionally led where ownership costs are concerned, according to the KBB 2019 5-Year- Cost-to-Own Awards.